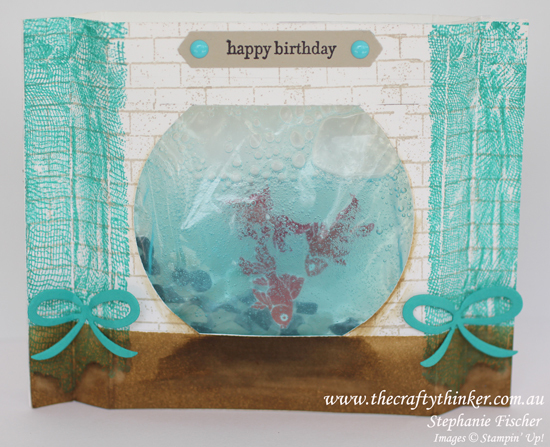 Welcome to the Crazy Crafters Blog Hop with our Special Guest stamper, Dawn Olchefske - we are thrilled to have Dawn join us this month and so excited to CASE (Copy And Selectively Edit) any project that has been created by her . We hope you find great inspiration from the projects. This is the card by Dawnthat I have chosen to CASE. As soon as I saw the card I started thinking of things that I could fit into the gap! This card features some sneak peeks of new products from the 2016 Holiday Catalogue that will be available from 1st September 2016. Eventually I decided to create a little living room scene with a bowl of fish! I used the Ghoulish Grunge stamp set (142238) to create the wall and "curtains". This is a new set in the upcoming Holiday Catalogue. I used my usual method to put the fish into the gel. (see here , here and here). 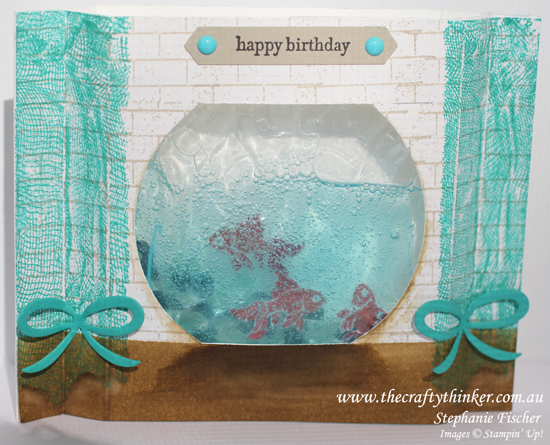 I used the Sprinkles punch with Basic Gray and Sahara Sand cardstock to create some stones for the bottom of the fish bowl. To create the bowl shape, I used the largest of the Layering Circles dies - partially cutting with it and then cutting the straight edges with a craft knife. The bows are dies included in the new Pretty Pines Thinlits Dies (141851) in the new Holiday Catalogue. Squeezing (gently!) the gel makes the fish move around the bowl!